Last week I made the first donation from sales of our specific British Heart Foundation charity products plus 10% of sales from our mid February event. 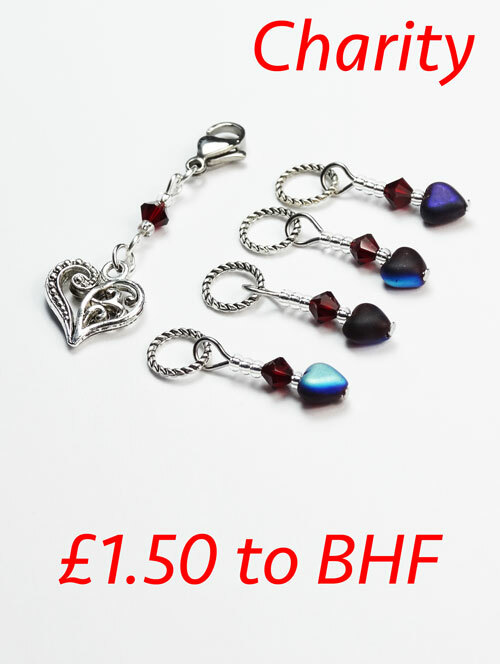 I couldn’t have hoped for a better start to our campaign as the Charity Deep Red Heart 4mm Stitch Marker set with Swarovski crystals – BHF sold out in the first 2 days, and our other products also sold well to enable us to raise donations in just a few days! Very happily our British Heart Foundation Just Giving page now has a grand total of £35 towards our £100 goal. Wow! Thank you! If you would like to help support through sales of Atomic Knitting Charity products, our shop is here. The shop has been restocked for immediate dispatch today. I will continue to donate on a monthly basis to our Just Giving page with donations from the specific products in the shop link. A huge thank you to everyone that helped support this charity through Atomic Knitting. I hope with your help, we can make another fantastic donation next month.